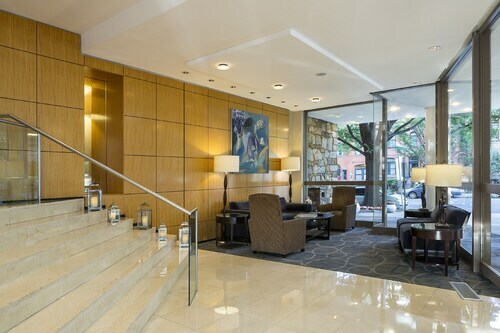 Located in Dupont Circle, this hotel is within a 15-minute walk of Lincoln Theater and Dupont Circle. Smithsonian's National Zoo and White House are also within 2 mi (3 km). 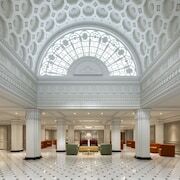 U Street Station is 10 minutes by foot and Dupont Circle Station is 13 minutes. 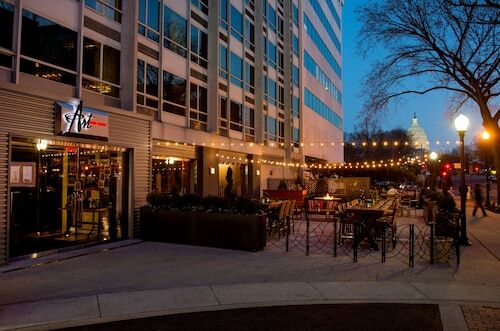 Located on Lafayette Square bordering the White House, this French-inspired hotel in Washington, DC, is within walking distance of the National Mall, Vietnam Memorial, and the Smithsonian Museum. How Much is a Hotel Room in Washington? 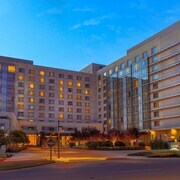 Hotels in Washington start at $109 per night. Prices and availability subject to change. Additional terms may apply. 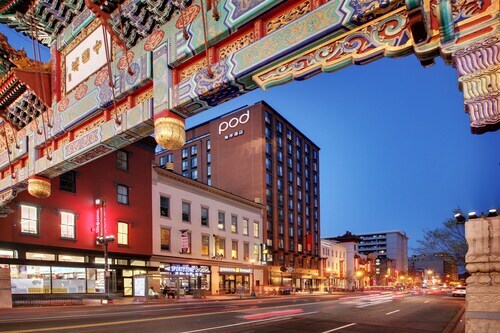 Our Guide To Cheap Hotels In Washington D.C. There are multiple airports serving the DC area, wise wanderer. 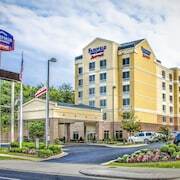 You can land at Dulles International Airport or Ronald Reagan Washington National Airport, both in Virginia and within a short drive of the top hotels in Washington, DC. Another option is the Baltimore/Washington International Thurgood Marshall Airport. Transportation: Once you’re on the ground and you reach the arrivals curb, you can get to most Washington, DC hotels in about a half hour. Of course, the journey depends on which airport you’ve arrived at. The Reagan National Airport is just 10 minutes from the center of the city, accessible via rental car or a short cab ride. If you’re landing at Dulles, the journey is a bit longer. 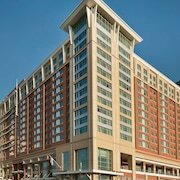 You’ll rely on a rental car or shuttle to make the 26-mile trek to your hotel. If you land at the Baltimore/Washington airport, grab an Amtrak train to Union Station in the city. Once you’re firmly in DC, you can rely on the metro system to get most places. 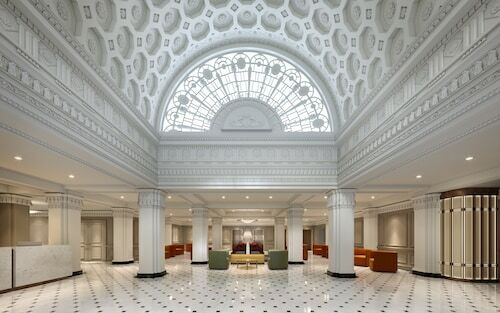 Security Considerations: Washington, DC boasts a bounty of history. Monuments whisper stories of the past and memorials offer a place for quiet reflection. And yet, the city remains the center of the federal government. That means many of the places you want to visit hold an important function and are protected by strict security measures, wise wanderer. If you want to visit the White House, for instance, you must gain permission from your congressperson in advance. Research museums and other points of interest in advance to find out if you can bring a bag, should expect a metal detector, or are allowed to tour as a member of the public. From cherry blossom season in April, when hope and temperatures spring eternal, to the snow-filled days of December, the seasons in DC are each unique. Your experience will be quite different depending on when you visit, sage traveler; plan your getaway accordingly. The average temperature in June is 83 degrees, while January is a brisk 42. The Smithsonian has been around since 1846, bestowing knowledge and imparting the wisdom of the past to visitors from around the world. Tour the collection of museums, which include the African Art Museum and the National History Museum. Enrich your appreciation of art and culture and explore the National Zoological Park, which is a part of the institution. Pay a somber tribute to the victims of the Holocaust at this moving museum. Exhibits take you through the history of the WWII occupations, including video footage and artifacts. While the hours you spend here will be serious, wise wanderer, they will be meaningful to be sure. Washington, DC offers a myriad of memorials to important historical figures and the brave service members who have died in conflict. Stand before the impressive marble Lincoln Memorial built to honor the nation’s 16th president, and watch the sun set behind the Washington Monument which was built for the first president. Stop by the Vietnam Veterans Memorial and to see and touch the list fallen soldiers’ names, and go to the National World War III Memorial to pay tribute to those who served. The history of Washington, DC will lure you to the city, and the current wheels of government will inspire you to find out more about how a bill becomes a law. Whether you visit in time to watch the blooms on the cherry blossom trees explode in a vibrant pink or make the journey in fall to watch the leaves turn orange—you won’t be disappointed. Book your hotel in the nation’s capital with Travelocity today, and your walk through history is off to an auspicious start. Need insider tips on must-see attractions in Washington D.C.? Check out our Washington D.C. travel guide! 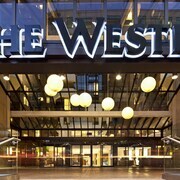 The hotel was quiet, the wharf area was lovely, exciting and clean. Transportation to sightseeing was very handy. Breakfasts were good with many choices. Staff was friendly and helpful. The location was fantastic and the property was perfectly suited to what our family needed. No pool...but you can't get everything. There were some maintenance issues that didn't get resolved (i.e. light above vanity didn't get replaced despite our asking) and the temperature was a bit tricky to maintain, but it was a great hotel. A safe, clean, and friendly environment are the main objectives of any hotel stay and this place double checks all of those boxes. Can’t say enough about the positive and inviting attitude of all the staff. Like most of DC the surrounding area contains all of life’s elements but the hotel is situated on such a manner that you always feel safe entering and exiting. The decor is mostly modern and stylish with a few older yet fully functional and clean furniture items within the rooms. The rooms and bathrooms clean and inviting. You don’t have access to room service, but the hotel restaurant does offer takeout and the food is excellent whether you dine in or take out. 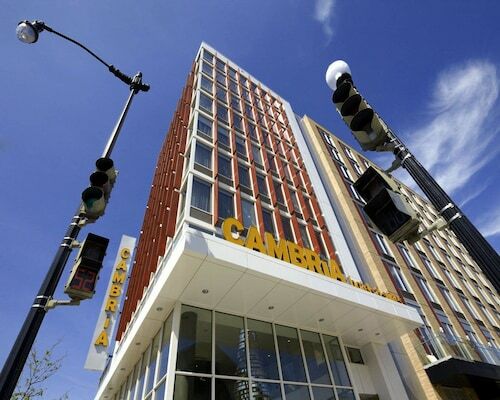 I will certainly recommend the Cambria DC to friends and family. It was convenient to the Foggy Bottom Metro Station. It was also close to George Washington University Hospital, which meant sirens passing by were frequently heard. 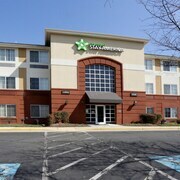 Room was spacious and clean, staff was gracious and cheerful. I always enjoy staying here. 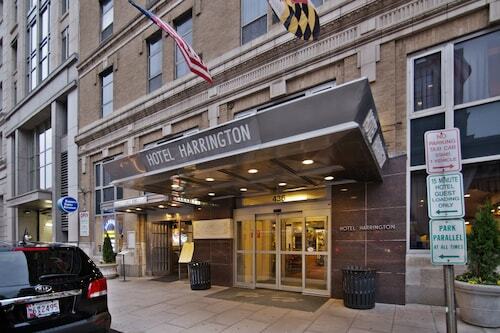 Very clean, friendly staff, and walking distance to most of the DC historical landmarks. I usually don’t spend too much on hotel rooms, but this one is definitely worth it. You won’t be disappointed. More Ways to Wander Washington, D.C.